We can find Pyramids in Egypt,right? Yes, you also find them there. In reality, the entire globe is built full of pyramids and that is extraordinary. Some are 10,000 years old, like the pyramids in Xi'an, China, about which in general little is known. There are a few hundred pyramids in a radius of 100 kilometers around the city of Xi'an, on the Qin Chuan plain in the Shaanxi province in central China. There were early stories and legends about Pyramids in China, but until a few years ago the area was forbidden territory. Not only are there myths about Gods who settled in this province, but the area was sealed off in modern times. 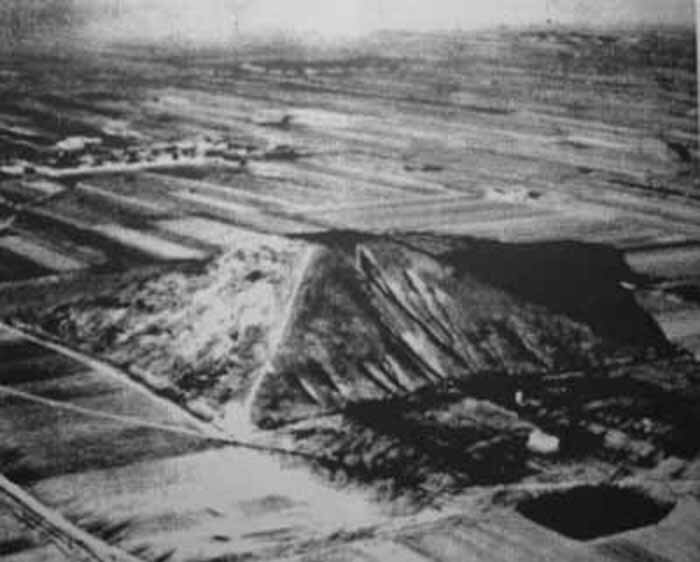 The Americans made a photo in 1945 in the Quinling mountains of a pyramid that would be called the 'white pyramid', but this photo remained in military hands, 45 years, neatly archived. The American fighter pilot James Gaussman reported a pyramid of enormous size that shone like a jewel. That would indicate that the outer layer would be covered with something that reflected the sun,as glass or crystal does. In itself that is an interesting observation. It is assumed that the Egyptian pyramids also had a 'finish layer' later eroded through erosion. The American fighter pilot was on his way on a routine flight from India to China during the 2nd World War. 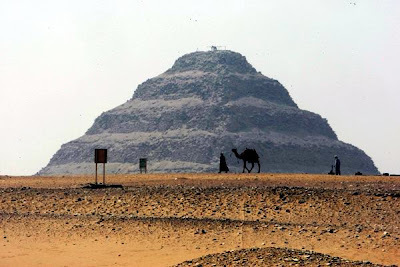 The estimation of the size of the pyramid in relation to nearby objects made the pyramid 300 meters high, which is higher than any Egyptian pyramid. In the 'New York Times' of 28 March 1947, an article by Colonel Maurice Sheatan appeared, the CEO of TWA, Trans World Airlines, in his interview, he reports that he has seen the 'white pyramid' from the air. On March 30th, 1947, a photo appears in the New York Times, but it turns out to be 'borrowed' and belonged to different pyramid. The zone became a 'nofly zone' and was sealed off by the military. It was only from 1995 onwards that the Chinese government reopened certain parts of this area. Earlier, stories and legends had been brought to India by a Buddhist monk, about the area that was or had been the home of 'the Gods', whatever we have to envision by that. As so often in these cases, these stories which reached a missionary post in 1917, were difficult to check out and were simply accepted as remarkable news. t is now assumed that the American Colonel Shean and the American fighter pilot James Gaussman knew each other because they both served in the same area during wartime. Perhaps the 'white pyramid' is one and the same observation. Chris Maier wrote a book about it: 'Die Weisse Pyramide', a book that was highlighted in 1995 in an article by Philip Coppens, in the magazine: Nexus, where it was called the Chinese Rosswell. To date, after the opening up of the area, the white pyramid of Sheahan and Gausmann has not been located. Something special must have happened in ancient times. Something that was special enough that from 10 000 years ago, in fairly primitive societies, the same type of building was being built or reconstructed around the world. Without any contact as we now know, between peoples and / or continents, or at least we assume so. We have become accustomed to our worldview and everyone knows that there are pyramids in Egypt, but perhaps they did not originate there, but they were the last ones to be constructed. Because of the blessings of the internet, we can trace whichever information, wherever it may be, within seconds, this is the first research time with unprecedented possibilities. 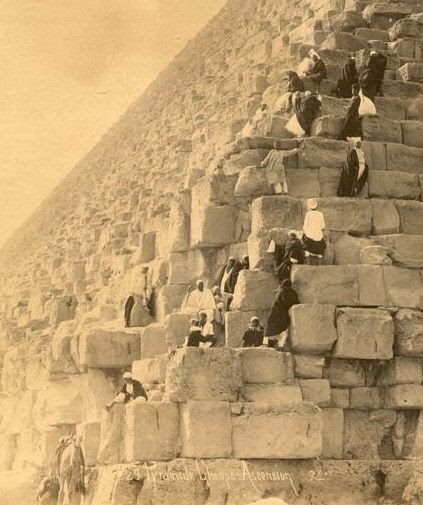 100 years ago, hardly anyone in the Western world knew about Egyptian pyramids. The Egyptian pyramids were covered with a white stone, which either reflected or absorbed something, for example heat or energy. The image of a kind of solar panel then comes to mind. Many of these stones have been used to build houses in Cairo and have been incorporated into walls. Just like what happened to the Parthenon in Greece, which was used as building material for houses in Athens. In the 'pyramid world' we see an equality in cover layer. Sometimes finished with mica, sometimes with white stone and sometimes vitrified. We find pyramids everywhere, in Europe, America, Alaska, Asia, underwater on sunken land. Most researched until now had no tomb function. What caused people in a society that consisted of primitive villages and hamlets to build pyramids and did they build them? Relatively feudal societies that are suddenly highlighted from the surrounding peoples and rise to greatness. Even the Bible mentions this, Abraham's ancestor of the Jewish people, a shepherd and nomad receives a visit from an extraterrestrial, a messenger, an angel who tells him that his descendants will become the chosen people. Chosen by whom, you might wonder. The logical answer is by the one who sent the messenger. A special deviant pyramid of all that we have seen until now found again in China in the former closed military area. The area where the oldest known pyramids are found, 10 000 years old, roughly 5000 years older than the oldest Egyptian pyramid. Is China the origin of the origin of the pyramid concepts, or was it simply for reasons unknown introduced there, it looks like it. The Baigong Shan mountain in the Quinghai province has a pyramid of 60 meters high at the edge of a salt water lake. Among the pyramids are three man-made caves or tunnels, which have three perfectly symmetrical entrances. the middle entrance is the only one that is still in good condition, the others are partially blocked or collapsed. One thing they have in common is a system, something you can not describe otherwise but as pipes running out to the lake under water. The image above shows the cross-section of such a pipe. The pipes go into the mountain below the pyramid. The curious pipes gave the pyramid its curious name, 'the iron pyramid', better they called it the metal pyramid and not so much iron. It is a particularly remote area and very inhospitable. An analysis of the 'pipes' carried out by the engineer Dr Liu Sholalin from Xitiessahn indicates that it is iron-like compounds (30%) with 31% silicon dioxide and 31% calcium and 8% of an unidentifiable chemical composition. The oldest pipes date back to 30 000 and the last are 5,000 years old, the same as the estimated age of the pyramid. Ancient legends speak about the sacred area where Gods arrived. Without wanting it the whole thing reminds you of a Nasa launch platform, there too you have pipe systems to drain heat and a water supply as cooling. The Baigon pipes and tubes were discovered by an American group of scientists who were searching for dinosaur fossils in the area, it was reported to the local government of Delingha. Nothing was done with this report until a report was published in "Henan Dahe Bao" (河南 大河报 ") by one of the researchers, Ye Zhou, and is now a deposited research area. The remarkable thing is that these pipes also occur in the United States. There they are called the 'Navajo tubes'. Beitler found them in the state of Utah and describes them as subhorizontal pipes but has also discovered vertical pipes there. Varying from a box cut of 1 to 50 centimeters and with a wall of 1 centimeter thick. In the Pliocene formations of Florida and Louisiana, this phenomenon also occurs, but has been given the name: 'Louisiana cylinders'. The Pyramids in China are made of earth that later became fossilized and sometimes vitrified. There are remarkable legends around the Akapana pyramid in Bolivia. Not only is there in ancient times a huge complex of roads and structures, constructed in desolation, roads that go nowhere but just stop as a grid, but there is also something called the time gate through which the Gods entered. What do we imagine by that? Was it an imitation in stone of something that one had seen? Was it a triumphal arch? It is so difficult to distinguish facts from legends. The pyramid of Cestius, in Italy, Rome is from before Christ, but there are also pyramids in Bosnia and in France. What happened to the vanished history or was that history not ours? On Tenerife, a Canarian island that belongs to Spain, 9 pyramids have been discovered. The island is not very large, so that is a respectable number and was formerly also visited by Dutch sailing ships, to make the crossing to South America. Finding favorable winds, you crossed the Atlantic Ocean. But first you took in fresh water and provisions on board at the last European point off the African coast of Marocco, the Canary Islands. Thor Heyerdahl, known for the 'Kontiki experiment' in which Thor tried to cross the Atlantic with a papyrus boat. To show that Egyptians could have had contact with the Maya, was obsessed by the Canarian pyramids, which are known as the Gúimar pyramids. He designed a hypothesis that the Egyptians used Gran Canaria as the last geographic stop on the way to pre-Columbian central America. The pyramid of the Sun is one of the largest South American constructions, it is attributed to the Aztecen. Its exterior was white, in this case plastered, why would you bother? Then there must have been a really good underlying reason. Ah, but then there are pyramids in the jungles of South America and in South-East Asia, which makes it special because of the great geographic distances over land. A little closer to home, in Cadiz, southern Spain lies a sunken, ruined city off the coast. Maxime Ashers discovered it. Outside a road network, there is also a pyramid structure between the other buildings under water. Dr. Brown with four expedition members, discovered a sunken city outside the Bahamas, with buildings with domed roofs, arches and, you guessed it, a pyramid. They found metal instruments that they transferred to the University of Florida for further research. The Deep Sea submersible; Alminaut, found a road that was hundreds of miles long and covered with a black magnesium oxide coating. Which road today would still be in good shape after 10 000 years (dating)? The Arl Marahall's expedition of Cay Sal discovered an underwater pyramid of 650 ft high, roughly 200 meters high. It is undeniable they are present on the land and there is a multitude of pyramids at sea. Somewhat outside the Bimini islands in 1960, the expedition of dr. Mansan Valentine discovered a ruined city laid out complete with, the pyramid. A stone 'calendar' indicating the stars' planets positions, found there, turned out to be 27,000 years old. That is 20 000 years before our earliest history! Cahokia in North America, the Missippi is characterized by a multitude of pyramids, a 120 in number, an amount that you simply do not overlook. The special thing is that this is quite unknown. It is located near St Louis, really in the middle of America. It does make you think. so many stubborn references, to flight and worship. Now the native people or the Indians take their myths very seriously and in the legends of the early Indian tribes there is a story about a people called the Anazi tribe. It is special that so little attention has been paid to it. The area was the center of a pyramid culture. A culture that reached its peak well before Europeans arrived. They worshiped the 'birdman', the man who could fly. They burned houses into the rock wall and in case of war they pulled up the ladders and retreated to an underground city. Such a kind of city is now found. The Hopi and the Navajo Indians still exist but they both have the same stubborn legend. The name Aznazi, meant the extraterrestials, say the aliens. A very long time ago, the birdman took the whole Aznazi tribe in one day and the whole people disappeared without leaving a trace. Then we still have the Ocmulgee mounds.They lived in Southeastern North America. Their presence can be dated back to 10,000 years ago. They are the forefathers of the Creek Indians. They lived on the banks of the Ocmulgee river and had wooden settlements, except for one structure. A temple like structure, a pyramid. Alaska obviously could not stay behind. With a pyramid that 'emerged' after an underground nuclear test in 1992. Finally, our underwater crystal pyramid at a depth of 2000 meters. Dr Meyer Verlag, an oceanographer, has recorded a pyramid shape at a depth of 2000 meters with the use of a sonar. During a conference in Florida, coordinates were transferred and images of the structures. 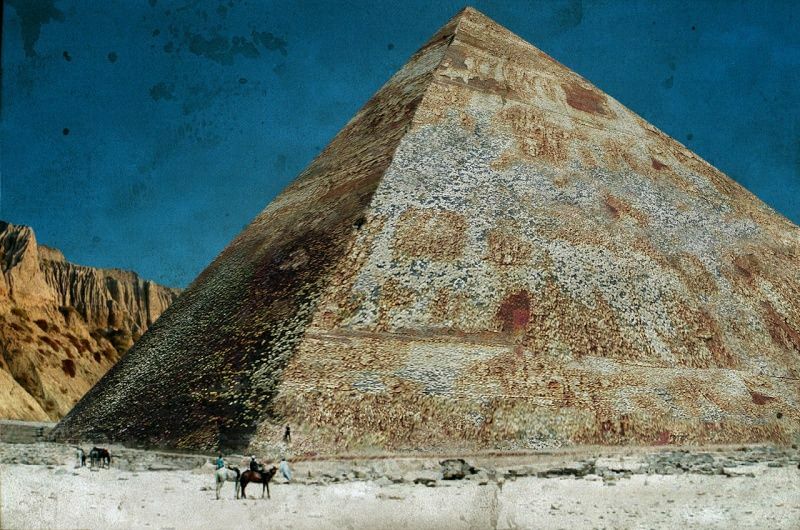 it concerns a main structure that is three times the size of the Egypian pyramid of Cheops and in very good condition. The surface appears to be crystal like in structure. Continued expeditions will have to provide more clarity. The article has all become a bit longer than originally planned, but it seems to me that the pyramid-like structure we find all over the world, has not arisen spontaneously in many minds simultaneously. The form itself and the connection always with the supernatural, or the outside earthly, is too emphatically present to be an accidental coincidence of circumstance. In conclusion, was the tower of Babel not such a structure that pointed upwards to heaven? Was there no meeting place with God (s), was that communication disrupted? Did the God interfere with the contact and thus the confusion and diversity in thinking and languages ​​arose? Did God suddenly have to leave? In any case, I have only one final advice, beware of birdmen! "Alien Ruins Show" Xinmin Weekly. October 13, 2003. "Chinese Scientists Head for Suspected ET Relics". Xinhua News Agency. June 19, 2002. Retrieved November 20, 2006. Li, Heng (June 25, 2002). 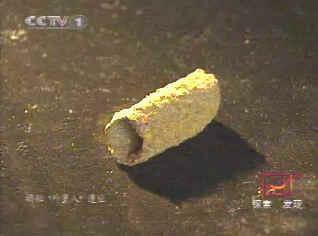 "Mysterious Pipes Left by 'ET' Reported from Qinghai". People's Daily Online. Retrieved November 20, 2006. Li, Xiangzhong; Zhou, Xin; Liu, Weiguo; Wang, Zheng; He, Yuxin; Xu, Liming (2016). "Carbon and oxygen isotopic records from Lake Tuosu over the last 120 years in the Qaidam Basin, Northwestern China: The implications for paleoenvironmental reconstruction". Global and Planetary Change. 141: 54–62. doi:10.1016/j.gloplacha.2016.04.006. Beitler, B.; Parry, W. T.; Chan, M. A. (2005). "Fingerprints of Fluid Flow: Chemical Diagenetic History of the Jurassic Navajo Sandstone, Southern Utah, U.S.A.". Journal of Sedimentary Research. 75 (4): 547–561. doi:10.2110/jsr.2005.045. Chan, Marjorie A.; Parry, W. T.; Bowman, J. R. (2000). "Diagenetic Hematite and Manganese Oxides and Fault-Related Fluid Flow in Jurassic Sandstones, Southeastern Utah" (PDF). AAPG Bulletin. Ponce Sanginés, C. and G. M. Terrazas, 1970, Acerca De La Procedencia Del Material Lítico De Los Monumentos De Tiwanaku. Publication no. 21. Academia Nacional de Ciencias de Bolivia. Vranich, A., 1999, Interpreting the Meaning of Ritual Spaces: The Temple Complex of Pumapunku, Tiwanaku, Bolivia, Doctoral Dissertation, University of Pennsylvania. Goldstein, Paul (1993). Tiwanaku Temples and State Expansion: A Tiwanaku Sunken-Court Temple in Moquegua, Peru. Šprajc, Ivan (2001). Orientaciones astronómicas en la arquitectura prehispánica del centro de México. Mexico City: Instituto Nacional de Antropología e Historia. ISBN 970-18-4180-8. "U.S. Flier Reports Huge Chinese Pyramid In Isolated Mountains Southwest of Sian". The New York Times. United Press. 1947-03-28. Retrieved 2016-01-28. "China's Great Pyramids Controversy". Retrieved 24 September 2014. Een mooie mystery tour, langs de piramides van deze wereld. Het wachten is eigenlijk op de eerste piramides op andere planeten.